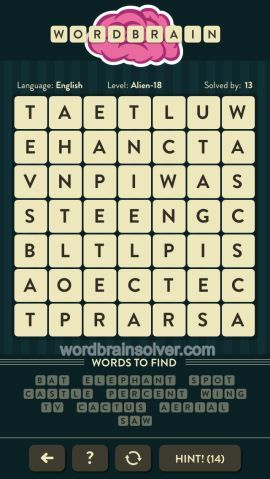 Wordbrain Alien Level 18 Answers and Solutions. Set up is different to this!! Level 18 alien no matter what I try can not get percent. I know it’s truck instead of TV and saw but still can’t work it out. Level 18(alien) can be solve. Some of the answers are wrong. The correct answers are bat, elephant, spot, castle, percent, wing, cactus, aerial, & truck. I solved it in that order. Please help me!! I know all of the answers but they just wont fit!! Where does elephant start etc please help fill the words in! Thank you so much to anyone that can help!! My puzzle is not the same I can” get it out most of the words are there. Do cactus before wing then everything flows.